The critical case of Mr K.
| Al hala al harija li al mad’u K.
The narrator is a young man in his mid-twenties who works at a large petrochemical corporation in Saudi Arabia. A social misfit, he dreams of becoming a writer. He soon discovers he has leukemia. The illness sheds a new light on his life, ultimately salvaging him from an existence he deeply despises. “The critical case of Mister K” is written in the present tense, in the first person, in the form of a weekly diary spanning over 40 weeks. As the narrator starts writing his story, he sometimes refers to the imagined hero of his imaginary novel, “K” (in reference to Kafka). The combination of very precise details and sharp insight into human relations; the total absence of pathos or melodrama and the narrator’s biting sarcasm make of this book an unusually appealing read. The novel eventually reveals how illness is in this case the opportunity for the narrator to define himself, to understand his place in society and in his family, to find the path to reconciliation, and finally free himself from the social norms that have constrained and crushed him all his life. A difficult, not always likable character, the very ordinary narrator is thus even more convincing and coherent. His astute observations on people, their social ambitions (often explicit, in Arab societies), their relation to others and reactions to the illness, are striking and sometimes even humorous. Living with his widowed mother, the narrator has a younger sister who achieved a “successful” marriage with a wealthy and respected banker, and an older brother who is soon to achieve a successful marriage himself, through the matchmaking help of their sister. A weakling as a young boy, the narrator had a poor health, which tried his father’s patience. As a grown man, he is a voracious reader and a recluse, an attitude his mother condemns and perceives as immoral. Clever and cultured, the narrator doesn’t fit in society. Acutely aware of himself, and of the absurdity of social norms, he loathes most his colleagues and their futile quest for power and recognition. After an unusually strong episode of nausea the narrator undergoes a series of tests. This is how he discovers he is at an advanced stage of leukemia. He starts a chemotherapy treatment, which after 6 months will put him out of immediate danger, without curing him. The narrator, following his doctor’s advice, will finally leave his home country and start a new life in Japan. Tackling the illness of modern times, this book is a universal, powerful read. 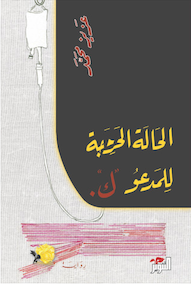 The lens of a traditionalist Arab society such as Saudi society, cleverly emphasizes the social dimension of illness. But beyond illness, this novel is also about modern life: Employment in large corporations and work in open space; relationships with colleagues and women; relationship with money; the absurd bureaucracy of important social institutions such as healthcare; the decay of modern Arab families, as well as the unthinkable pressure they can still exert on individuals. This novel was shortlisted for the IPAF in 2018. In the oncology ward I spoke to other patients. One of them told me that if I pressed the doctor, he might let me go home. The others weren’t quite so helpful. There was one sweet old woman who launched straight into a long and impassioned monologue, as though she’d just been interrupted and was picking up from where she’d left off. A blow-by-blow account of how she’d been cursed by the evil eye. Central to all her stories was the figure of her envious neighbour, a woman who was always round at her house, who had been coming round from the time of the Gulf War, and who in all that time had never once let the word God cross her lips. What had happened was that, no sooner had the neighbour spoken admiringly of her energy and good health, had praised her for being in such good condition at her age, than the woman had fallen ill. When she’d got the results of the tests she had called the neighbour up and swore at her, and said prayers for her, and pleaded with her to put God’s name in her mouth, at which the neighbour had answered back with insults and prayers of her own, without ever protesting the main charge, that she was the one who’d made her ill. Wasn’t that proof enough? I didn’t know how to respond. After telling me her tales she stayed silent for a few minutes, and I assumed she had exhausted her reserves of energy, only to find her turning to me abruptly and asking, And you? Who cursed you? as though she was asking what kind of cancer I had. No one, I said, and she was taken aback. But everyone knows that the cancer comes from envy! I wondered if I should feel upset that it had occurred to no one to date that I might be the victim of envy. RAYA has world rights to this title. Check Aziz Mohammed‘s page for an updated rights situation.